The Report Timeline Tab, the second of the four tabs, gives a DLE-wise view of the completed backup run on a particular date of a particular Backup Set. Like all other functional pages of ZMC, the Report Timeline page has its main functionality in the center, while other common-to-most-pages functionalities are grouped at the top of the page. 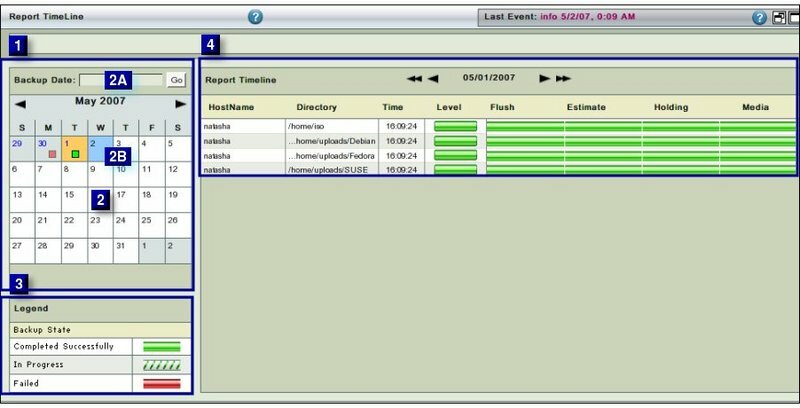 The main functionality of the Report Timeline page is to give users a DLE-wise view of a past backup run of a Backup Set. 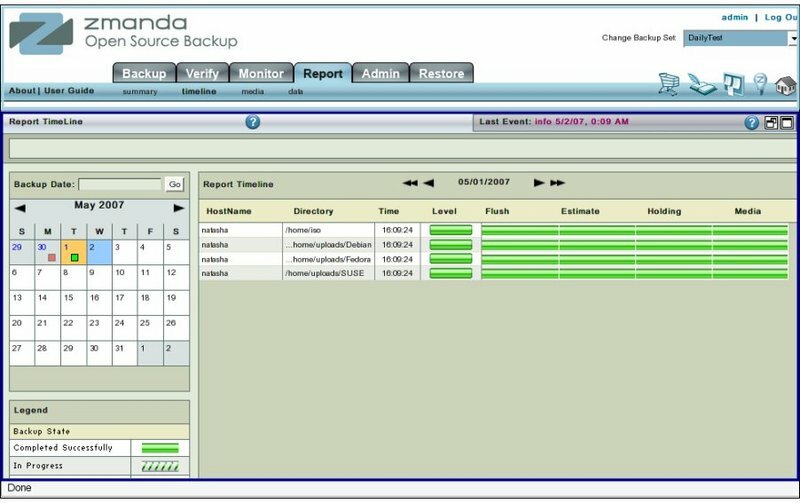 The view gets displayed using the same legends that the Monitor page would use for current running backups. The Report Timeline page is visually divided into two panels just as the Summary Report page was. The Right hand panel (No 4 above) mainly contains a graphical visualization of how the backup process happened for each DLEfrom the Backup Set . By default the Report Timeline page opens with the current month calender shown in the Left hand Date and Legend panel. The Report Timeline Data , if any, for that date will be displayed in the Right hand panel. Cells of individual dates display the Legend relating to Report Summary. Though a token place has been provided, the page does not display any legend. Report has DLE -wise rows showing how backup proceeded on that date. A detailed explanation of these items is found here in Monitor pages of the User Guide. The Right hand Report Timeline panel has the following navigational aids i.e.